has admitted he was surprised to be dropped by England for their final Test of the winter, just a few months after being named Man of the Series in Sri Lanka, but is willing to contemplate whatever potential avenues are open to him in an attempt to remain in contention for the Ashes. Foakes was left out in St Lucia, despite a fine start to his Test career that included making a century on debut, as England returned to No. 7 in the batting order and his coveted role of wicketkeeper. 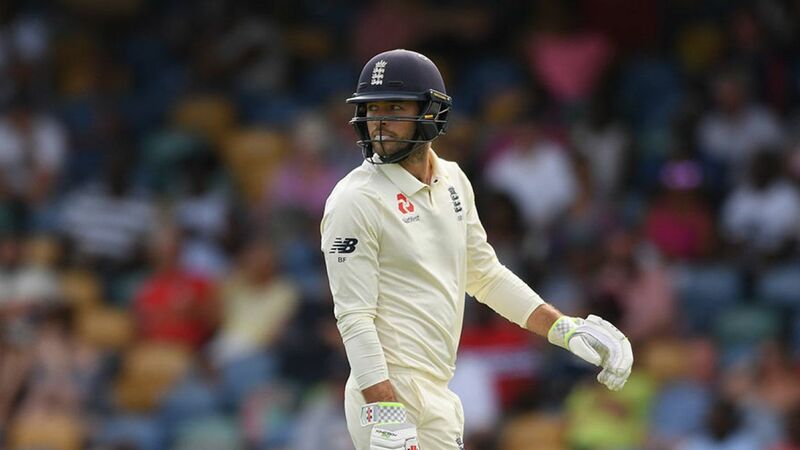 Having rebalanced the side, England claimed a small-consolation victory in the third Test against West Indies, and left Foakes with a few questions about where to go next. Widely regarded as the best gloveman in the country, Foakes may now find his best route back into the team is as a specialist batsman - even discussing with Trevor Bayliss, England's head coach, about the possibility of pitching himself as a candidate for the Test team's troublesome No. 3 slot. It is a measure of his understated nature that Foakes was seemingly readying himself to be dropped from the outset, after replacing the injured Bairstow in Galle and then playing an instrumental role in England's 3-0 whitewash of Sri Lanka. His debut series was "a dream come true" but a couple of unfortunate dismissals in the Caribbean - caught at short leg and playing on while pulling - contributed to him losing his place after just five Tests. "I didn't think I'd be getting dropped that game," he said, reflecting on his experience at Surrey's pre-season media day. "From what you hear within [the squad] I was quite surprised to be dropped. It was a case where, without making excuses, a couple of the dismissals were quite freak dismissals. "I didn't feel like I had had an absolute stinker. It was one of those phases. I didn't feel like I was horribly out of form and you get dropped. I just didn't get runs, a little bit of bad luck, and it's over before you know it - that sort of tour. It's obviously quite difficult to deal with that brief period. "From what I was told they wanted to get Jonny back down to No. 7 and didn't like that balance [of Foakes keeping at No. 8]. In a county season I've been through many stages where I haven't got runs and you get a long stretch. But I guess that's the first learning of international cricket, that you don't have that luxury. You do get dropped, you do get back in at certain stages." Foakes had initially been planning to take some time off, after several winters of involvement with England and the Lions, so his surprise elevation to the Test side after Bairstow rolled his ankle during the ODIs in Sri Lanka was the start of an unexpected journey. "I think it was a rollercoaster, but a dream come true," he said, "an amazing winter where I guess I didn't think it would come about and then things went better than I could ever expect. And obviously you've got the other end of the spectrum, so with international cricket I guess that's the way it is. But it was an amazing winter." As for whether he could force his way in as a batsman - he averages 40.70 in first-class cricket, usually while playing as a keeper - Foakes is uncertain. England's lower-middle order is the Test team's batting stronghold, with most of the question marks around the top three, but Surrey are well-stocked with options in that area - including Foakes' team-mate Jason Roy, . But while he is a markedly different player, Foakes can perhaps look to the example of, another wicketkeeper-batsman in the Test XI, for inspiration. Buttler's return, sparked in part by his form in the IPL, was one of a number of selectorial dice rolls that paid off for England last year. "I'd play for England wherever I could get in," Foakes said. "I'm speaking to Ed Smith next week and I'll ask him a few questions about routes back into the team, how I can get back in. "The way the Test team is now, it's a versatile team and there are some left-field selections and that sort of thing. I've never thought I could play as a batter only, I always thought I'd have to get in as a keeper but I guess the way it's going, if I could push my case and get a lot of runs then you never know. "Obviously I'd love to bat three but I've never done it with keeping. There are certain steps up but I'd love to give it a go. Technically I'm quite happy, it's obviously a more challenging place to bat but as with all new challenges you evolve, you learn. I'm not the most attacking player so am probably suited to batting up a little bit." Whatever questions he may have for the England management, Foakes has no doubts about his desire to get back into the side. "It was something that I have worked my whole career for. To get there you will get highs and lows, but especially in Sri Lanka, the feeling out on the pitch with the guys was the best feeling I've ever had in cricket. So I want that again."